On a cut glass platter, sat an elegantly decorated cake. It was covered in white fluffy icing and topped with a ring of delicate purple and yellow pansies. The flowers glistened in the sunlight. My culinary talented neighbor picked the flowers from her window box garden and candied them. She then adorned the top of the two-tiered cake with the blossoms. Candied blossoms, commonly called crystallized flowers, are simply edible flowers temporarily preserved in a light coating of egg whites and sugar. Using flowers from your own garden makes the project especially rewarding. And, they are relatively simple to create. The most important item in the list is the flowers. They must be edible and pesticide free. Adorning a beautiful confection with potentially lethal decor could result in unintentional food poisoning. Another important factor is the flower’s shape and strength. Flowers with a simple configuration, like pansies, are easier to work with than a large rose. Flowers that are too weak or small may fold under the weight of the sugar. Lastly, if you can’t wait till spring for your edible blossoms to bloom, check your local gourmet grocer. Edible flowers, when available, are often displayed with the fresh packaged herbs. To begin, mix in a small bowl one-teaspoon of powdered meringue with one tablespoon of water. Try to get as many of the lumps out as possible. In another small bowl, place a 1/3 cup of granulated white sugar. This makes enough to cover approximately 35 quarter sized flowers. Next, place a flower face down into the meringue. Use your fingers to gently press the flower down. Once covered, lift the flower out of the liquid and hold face up. Use the tines of a fork to separate any petals, which may have stuck together in the process. Check to make sure the face of the flower completely is coated. If necessary, use the small brush to apply additional meringue. Areas not coated with meringue will wrinkle and wilt in the drying process. Over a small plate, use a spoon to gently pour the sugar over the flower. Shake off any excess sugar and set the flower face up on a wax paper covered baking sheet. 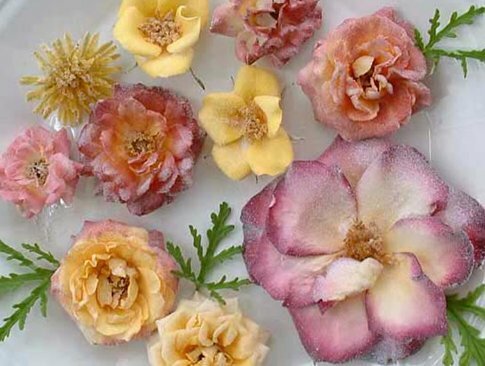 Once on the wax paper, arrange the petals back to their natural form. Repeat the process for the remaining flowers. To harden the flowers, place the baking sheet in a warm and dry location for at least 48 hours. 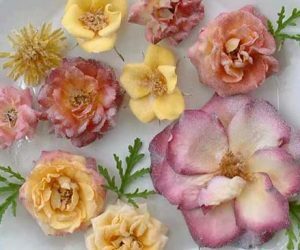 Flowers with many over lapping petals will take longer to dry. If kept in a dry location, the candied blossoms will keep for up to a month. Uses for candied blossoms are limited only by your imagination. To fasten them on confections, use a small dollop of white icing or sour cream. Try them on shortbread wedges, double crusted pies, and scones. For cakes, try placing the blossoms in a ring around the cake’s outer edge or try arranging them in a small circle in the center of the cake. With spring approaching I’ve been thinking about planting flowers. Curiously, the flowers that top my planting list would nicely compliment the top of a whipped cream frosted almond cake!